Generally accepted therapeutic modalities including physical therapy, manipulation and injection of steroids or anesthetics locally are not always satisfactory in accomplishing the desired therapeutic result in pain management. Recently rekindled interest in the ancient art of healing - ie, traditional Chinese acupuncture - has forced us to reassess some of the conventional Western approaches and gradually incorporate the useful principles of acupuncture into the mainstream of modem medicine. Many trigger areas in association with the so-called myofascial pain syndromes were carefully mapped out by Travell.1 Interestingly enough, there is a striking coincidence of the locations of these trigger areas with the traditional Chinese acupuncture loci, and the pathways of pain radiation from the trigger areas closely resemble the acupuncture meridians, as recently described by Frost.2 However, the system of acupuncture loci and meridians appears to be more elaborate and organized than the trigger areas thus far mapped out by modem investigators. Moreover, some of the highly effective acupuncture loci have not been described as useful trigger areas. Consequently, the question was raised whether by applying the trigger-point injection technique directly to these previously undescribed acupuncture loci, one might obtain better clinical results. Shoulder pain is a commonly encountered orthopaedic problem in modern medical practice. Regardless of etiology, it is a complex problem because the various neuromuscular elements that can be involved in the production of shoulder pain are many. Quite often there is concurrent involvement of the neck and arm. Shoulder joint injection or injection of adjacent trigger points with local anesthetics and steroids has not always been fruitful. Therefore a clinical trial applying the injection technique to a singular acupuncture point was conducted to ascertain its efficacy in the treatment of chronic and subacute painful syndromes involving mainly the posterior shoulder. There were 12 patients in this study, including 4 men and 8 women ranging from age 24 to 77. All of them suffered from pain involving the posterior aspect of the shoulder, either unilaterally or bilaterally, some with radiation of pain down the entire length of their upper extremities or extension to the neck region and anterior shoulder. The patients were selected according to the distribution of pain to the posterior shoulder and not according to the diagnoses, which encompassed myo-fascial pain syndromes, bursitis, tendonitis, early rheumatoid arthritis, posttraurnatic arthritis and radiculopathy. The duration of symptoms varied from 10 days to 8 years (7 patients had pain less than 1 year and 5 had pain for more than I year). All patients had several trigger points in the shoulder region, but one acupuncture locus in the scapular area as described below was consistently tender in the entire group of patients. 10-cc disposable syringes with 1.5-inch 23-gauge needles were used. Fluid for injection consisted of either sterile normal saline or 1% plain lidocaine. Selection of Patietnts Only patients with pain involving primarily the posterior shoulder and/or scapular area were included in this study. They may or may not have had pain radiation to the arms or to the neck region, but the acupuncture locus in the scapular region as described below must always be reactive - in other words, it must be one of the trigger points. The acupuncture point is known as Tien Tsung (SI 11).3 The patient is to assume an upright sitting position with both arms relaxed. The tip of the scapula is then palpated and an imaginary line is drawn to meet the spine of the scapula. This line is then divided into three equal segments. 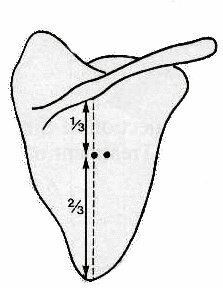 The upper division point or the point that is one third distance from the scapular spine and two-thirds distance from the tip of the scapula is the approximate location of the acupuncture point Tien Tsung (Fig 1). By palpating this point or slightly laterally, one can appreciate a small depressed area which is usually the point of maximum tenderness in the scapular region. This locus is extremely safe for injection because there is no vital structure in the neighborhood and the lung is protected by the scapula itself. The acupuncture locus can be easily marked by the tip of a ballpoint pen with the ballpoint retracted. If one applies moderate pressure, along with a slight twisting motion, a small circular indentation will appear on the skin and can serve as an excellent marker. The area is then sterilized. To minimize pain, the skin is penetrated with a swift motion by the hypodermic needle attached to the syringe. The needle is then slowly advanced until a sensation of congestion or heaviness with radiation to the shoulder and sometimes down the arm is felt. If this is not accomplished, the needle is partially withdrawn and then advanced at a slightly different angle until this type of sensation is obtained maximally. Fluid contained in the syringe - which may either be 10 cc of normal saline or 5 cc of 1% plain lidocaine - is then quickly and forcefully injected into the site. The optimal depth of needle penetration varies from individual to individual. Quite often the maximal sensation of heaviness or dull ache can only be obtained by fairly deep penetration. However, during the procedure, care should be taken to avoid jabbing too deeply to avoid the very pain-sensitive periosteum of the scapula. Quick and forceful injection is necessary to augment these sensations which appear to be essential to the successful outcome of the treatment. In general, the more tender the acupuncture locus, the more intense the sensation of injection and the farther it will spread toward the shoulder and down the arm. At the end of the injection, the needle is quickly removed and pressure is applied to the injection site, which is then massaged momentarily. If normal saline is used, the sensation of injection is usually somewhat uncomfortable for the patient and may last from a few minutes to 1 or 2 hours. On the other hand, lidocaine also produces a burning sensation, but that is quickly supervened by localized numbness. As a result, lidocaine injection quite often can abolish the pain in the shoulder area completely, although this effect may be temporary early in the course of treatment. Fig 1. Diagram by Dr. Lee illustrates the anatomic location of Tien Tsung locus. The patient assumes an upright position with both arms relaxed. The tip of the scapular is then palpated and an imaginary line is drawn to meet the spine of the scapula. This line is then divided into three equal segments. The upper division point or the point that is one third distance from the scapular spine and two thirds distance from the tip of the scapula is the approximate location of the acupuncture point Tien Tsung. Treatment should be instituted every other day or three times a week initially. When there is significant clinical improvement, the treatment can be tapered down to twice a week and subsequently to once a week before stopping the procedure altogether. Six consecutive treatments are used arbitrarily as a series and then followed by a period of rest of approximately 2 weeks' duration. If an injection using normal saline fails to produce the desired therapeutic effect after a few treatments, 1% plain lidocaine is then used instead. Most patients suffering from pain in the scapula and posterior shoulder have difficulty raising and extending their arms to the full extent. Consequently, the degree of limitation of motion of the shoulder joint is an excellent guideline for objective evaluation of clinical improvement. One fairly easy way of establishing the mobility of the shoulder joint prior to treatment is to have the patient stand facing the wall and then let his fingers crawl up the wall until they cannot reach up any further. This maximum height can be marked by a piece of tape. Five minutes after the completion of the procedure, the patient is asked to perform the same task and, again, the maximum height reached by his fingers is noted. Therefore, an objective means of judging the improvement in the range of motion can be readily available before and after each treatment and from treatment to treatment. The patient is also asked to report the subjective change in his pain by using a rough scale. Since pain is a very difficult sensation to quantitate, the patient is requested to report whether the pain is approximately 25%, 50%, 75%, or 100% decreased - or increased - as compared to its intensity before the treatment. In this series of 12 patients who suffered from severe posterior shoulder pains, 7 (58.3%) became either completely asymptomatic or with only minimal residual, 2 (16.7%) claimed to be 75% improved, 2 (16.7%) were 50% improved and 1 (8.3%) received no sustained benefit from the treatment. Those who did not fully respond to the treatment had components of pain affecting more than just the posterior shoulder. Follow-up at 2 months to up to I year after the termination of therapy revealed that the pain relief was retained in all cases. It is worth noting that in some instances the relief of pain and increase in the range of motion were almost immediate following the injection with normal saline into the acupuncture locus. Another frequently observed phenomenon was that pain often exacerbated during the first 24 to 36-hour period after treatment, only to be followed by a marked improvement. Equally interesting is the fact that as the same treatments were carried on sequentially, the patient's condition would suddenly deteriorate for a few days and then as treatments were tapered off or stopped, a steady and more substantial improvement would take place and remained so with the passage of time. These types of biphasic responses seemed to occur more often with lidocaine injections. With the exception of two cases, all cases in the study involved the shoulder unilaterally. The two cases of bilateral pain were symmetric in distribution, and both patients responded to the treatment with complete relief. Some patients responded more favorably to saline injection, while others improved more readily with lidocaine injection. A subgroup of patients who suffered from severe shoulder pain with radiation down their arms seemed to have benefited most dramatically from the technique of combining acupuncture and trigger-point injection therapy. It is also worth noting that one patient with calcium deposits in his right shoulder joint derived 75% long-lasting pain relief from this form of treatment. The gate-control theory commonly invoked to explain acupuncture appears to be untenable because the pain relief may be evident not during but after the treatments. In other words, pain relief may occur at a time when there is no stimulus to close any "gate." Additionally, pain may actually get worse before it gets better as the result of a single rather brief episode of stimulation. The frequent and repeated stimulation of this kind seems to force the neurophysiologic pathways involved in the production of pain to learn a new habit or to set up a new circuit to eliminate the painful impulses. The temporary worsening shortly after a treatment and the biphasic clinical responses in the course of therapy also rule out placebo effect or psychologic factors as significant elements in mediating the therapeutic efficacy. Quite often the improvement is so dramatic that the range of motion of the shoulder joint is substantially increased almost instantaneously and, therefore, it is difficult to ascribe this to psychologic factors. Although normal saline and lido-caine injections are both effective, they are diametrically opposite modes of stimulation, as the former involves hyperstimulation while the latter involves the absence of stimulation. This explains why some patients responded better to one form of injection than the other. In the conventional type of trigger-point injection, the trigger points are located by palpating the painful area in general. Unfortunately, there may be many different trigger points in a painful area such as the shoulder and it is not always easy to tell whether one given trigger point is of primary or secondary importance. Moreover, to locate the trigger points accurately is a tedious procedure. Since the trigger areas appear frequently at the same locations as the acupuncture loci, it is more convenient to use the system of acupuncture points and meridians as a guide to locate the primary trigger points. Trigger points are so named because pressing on them produces pain in an area that may be some distance away. Conversely, it may also be a viable concept that injury to a certain region of the body can actually activate or trigger the trigger points in that general area. For example, injury to the posterior shoulder or scapular region invariably involves the Tien Tsung point, which becomes tender or reactive as a result. It appears that this particular point has a fixed anatomic location and actually processes physiologic information in that general area. If that area were injured, it would become tender and serve as a point of expression. This could explain why so many trigger areas occur so consistently in fixed anatomic locations. They can be considered as entities that exist normally even at the absence of pain, but will stand out more prominently if they are activated. The acupuncture meridian is merely a series of acupuncture points that are related to one another in the same pain-reference zone. The Tien Tsung point is one of the important points along the so-called small intestine meridian, which travels from the scapula and posterior shoulder down to the extensor surface of the upper extremity. Perhaps it is for this reason that a powerful stimulus provoked at the Tien Tsung locus in the scapula can alleviate pain in the shoulder and arm in such a remarkable way. If the concept thus envisioned is correct, the technique described here can be used to treat a large variety of pain syndromes. By employing additional acupuncture loci such as those in the neck and arm, one may even improve upon this already highly effective modality in treating shoulder pain. However, any practitioner of modern medicine without detailed knowledge of acupuncture can still perform this highly effective and extremely safe procedure to treat posterior shoulder pain by simply injecting one single locus in the scapula.